So I have returned to the United States and back on assignment for the next couple of months, so it’s time to get down to business. A couple of new HIPEC articles came out – which I thought readers might enjoy. For lighter fare, we will start with an article from the Vancouver Sun. The first article, by Erin Ellis of the Vancouver Sun, is a Canadian fluff piece complete with sensationalistic headlines and dramatic patient interviews designed to draw attention to Vancouver General Hospital’s new HIPEC program. The second article, which is more academically and scientifically based, is focused on a study presented at the Southern Surgical Association in December by Levine, et. al. (2014) “Intraperitoneal Chemotherapy for Peritoneal Surface Malignancy: Experience with 1,000 Patients” looks at long-term survival with HIPEC in patients with disseminated peritoneal malignancies. This study is remarkable for both the duration of the prospective study (which began in 1991) and the large amount of participants for a single site study. The vast majority of patients enrolled in this study had appendiceal cancer as their primary, but the study also included patients with ovarian, gastric, mesothelioma and colorectal cancers. The evolution of the procedure and institutional experience led to improved outcomes and reduced complications over the course of the study. Part of this was due to the development of better patient selection criteria. This information comes as a ray of hope for patients with these diagnoses and previously given only dismal prognoses. Dr. Edward Levine, the primary investigator, is the Chief of Surgical Oncology and Director of the Comprehensive Cancer Center at Wake Forest Medical Center in North Carolina. Levine, et. al. (2014). Intraperitoneal Chemotherapy for Peritoneal Surface Malignancy: Experience with 1,000 Patients. Journal of the American College of Surgeons, 218(4): 573–585 (April 2014). No free text available. We’ve talked a lot about HIPEC here – but we have not really talked about the risks of treatment. While we mentioned the arduous nature of the procedure itself, we’ve left more in-depth discussions to the oncologists. Now researchers at the National Institute of Health have developed a tool to help clinicians and their patients determine the risks of HIPEC. In an article published over at Surviving Mesothelioma, the authors discuss their recent study and the results. Since the procedure itself carries significant mortality – the calculator offers an important tool for determining who the best candidates are for successful treatment with this procedure. Now that Case Western has decided to adopt HIPEC for treatment of gynecological cancers (uterine, ovarian, endometrial etc.) they have published an article patting themselves on the back..
That’s one of the reasons we’ve championed HIPEC here at Bogota Surgery – state-of-the-art cancer treatment with an excellent track record according to medical literature and published research. Too often patients, particularly patients with cancer or other serious medical illnesses are preyed upon with junk or uncertain science, like super-vitamin supplement programs, Laetrile clinics and quasi-futuristic stem-cell therapies. But HIPEC is different, and it’s been here for quite a while – with over ten years worth of scientific data to support continued experimentation (large-scale) and use. 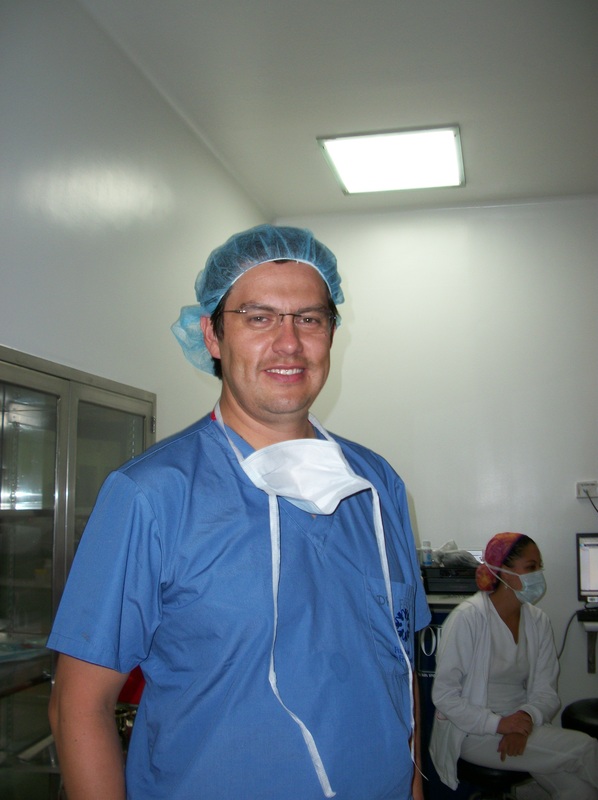 We first encountered HIPEC in Bogotá at the hands of Dr. Fernando Arias at Fundacion Santa Fe de Bogotá. In our continued quest for information (see our series on HIPEC) – he continues to be at the forefront of HIPEC treatment with more experience than doctors like Dr. Trey Blazer at Duke, teams at Case Western, and the other scattered programs throughout the United States. With the exception of its creator, Dr. David Sugarbaker – Dr. Arias has as much experience, evidence and training as anyone I’ve encountered..
More ongoing research trials to validate HIPEC as a potential treatment for ovarian cancer. The University Hospitals of Cleveland, Ohio recently started several new clinical trials to test the effectiveness of hyperthermic intra-peritoneal chemotherapy in women with ovarian and endometrial cancer. Unfortunately, the trials are small (around 60 woman) which means that even positive results will be far from definitive for researchers involved in the HIPEC debate. It also offers only limited opportunities for patients with ovarian cancer to receive potentially life-saving treatment. Medpage recently published a nice overview on ovarian cancer and the current treatment modalities – which can be seen here. What is HIPEC? What’s it used for? If you remember, previous New York Times articles questioned the efficacy of hyperthermic chemotherapy given during cytoreductive surgery. We promised to investigate, and return with more results to this question. Recently several articles have been published on the topic, including this one – in the journal of Clinical Oncology. This narrative by Maurie Markman talks about the quick dismissal of HIPEC by many oncologists, particularly for larger tumors – and he questions the wisdom of this approach in light of recent research results. In fact, several large new American studies – including one at Case Western are examining the use of HIPEC, particularly in gynecological cancers like ovarian and uterine cancers which carry a dismal prognosis. This last link isn’t really news – it’s a press release, but since it’s on a surgical oncologist (Dr. Wilbur Bowne) who was an early American adopter of HIPEC, I thought readers might be interested. Looks like it’s about time to check in with our favorite surgical oncologist, and HIPEC expert, Dr. Fernando Arias.. Check back soon for more..
HIPEC in the news again..
Another story about bringing HIPEC to the masses – this time in Mumbai, India.. I have to wonder about the research for the article – everytime I see the phrase, “A ray of hope”.. sounds suspiciously like the original title of a certain article (in Colombia Reports.com) all of us are familiar with over here at Bogota Surgery.org. HIPEC and peritoneal mesothelioma – more effective in women?